This post is the first in a series of three guest posts for Adoption Awareness month. Allow me to introduce you to one of my and John's biggest cheerleaders: my friend Arayna. We met Arayna through church and when she discovered we were adopting she was on us like irony on a hipster. For the past year every encounter we've had with her has been met with deep encouragement, heartfelt words, and usually a weepy set of eyes or two. Arayna has also spent a couple evenings putting her notary stamp and signing skills to use, notarizing what feels like hundreds of adoption documents. She never complains about hand cramps or how much ink we've asked her to spill for us though; she just keeps on encouraging and cheering us on. Arayna's been so encouraging because she knows. Not the kind of, "I know the waiting is hard" or "I bet you are so excited!" knowing, but the real kind of knowing. The I've been there kind of knowing. Arayna and her husband Jeff have welcomed two beautiful children, Zac and Emily, into their family through the gift of adoption. A couple weeks ago I asked her if she would be willing to share her story on my blog. With a bit of trepidation but a generous and willing spirit she said yes and much to my delight she chose to share on the part of these adoptions that is very tender and beautiful: the openness. Welcome Arayna. 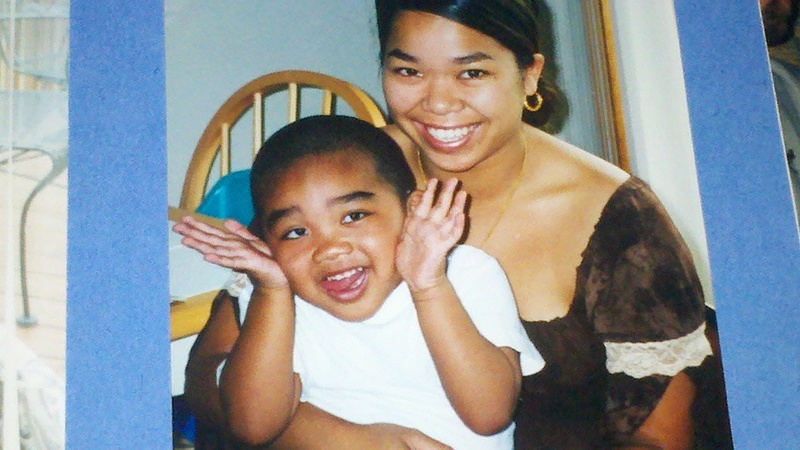 I hope you are blessed by her story of open adoption as I have been. Open Adoption - an unexpected blessing. would have emphatically told you “no.” I wasn’t the least bit interested and extremely afraid. Fast forward to today and I wouldn’t have it any other way. Let me give you a little context into how things have changed over the last several years. precious babe in your arms. to listen to a birth mother share her story, her experiences, her regrets, basically her heart. It was heart wrenching to listen to, but it also left an amazing impact on me. After listening to this young woman talk, it dawned on me that what these birth mothers craved was simply reassurance. She understood that she was going to miss out on much in this little one’s life, and just wanted something, anything to reassure her that her child was loved, was growing and developing well, and that she had made the right decision. A few pictures, a few notes, a visit now and then seemed so little to give in comparison to what she was giving up. And that was how I looked at it. Someone had to lose something in order for someone to gain. I haven’t forgotten that lesson. Our open adoptions started off hesitantly; meeting at neutral locations, short amounts of time, and a fair amount of trepidation in my heart. There were lots of tears all the way around, but there were lots of smiles and laughter too. We slowly moved our way to visits in our home, including more of our family and at times more of our birthmother’s families as well. It was a progression; we didn’t just jump in with both feet. It took time to build those relationships and more importantly for us all to build trust. In the beginning there were lots of “rules:” curfews, phone calls to check in, all of it. I would pace back and forth in front of the door beginning a half hour before the kids were due home. I admit, I was afraid. The never ending “what if’s” would creep in and I would be a nervous wreck. Neither of our birth moms ever gave us a minute to worry. Those first few times the kids were gone without either of us with them was stressful to say the least. But we learned how to navigate those waters, we learned how to trust, and most of all, we learned how to love. Zac and Jane on Zac's third birthday. Every family has its own traditions and ours now include both of our birth mothers. Our son’s birth mom, Jane, spends each Christmas Eve with us, and has for the last 11 years. She comes to our home; we enjoy dinner together and then the highlight of the night: opening presents. It’s a time for family, and she is family. With our daughter’s birth mom, Alescia, we go each year to her family’s Christmas party and a large birthday celebration each summer. Again, it is a time of celebration; a time for family. One of the things that we’ve discovered on this adoption journey is that we didn’t just add to our family with a son and a daughter, but with two lovely young women who have blessed us beyond reason. 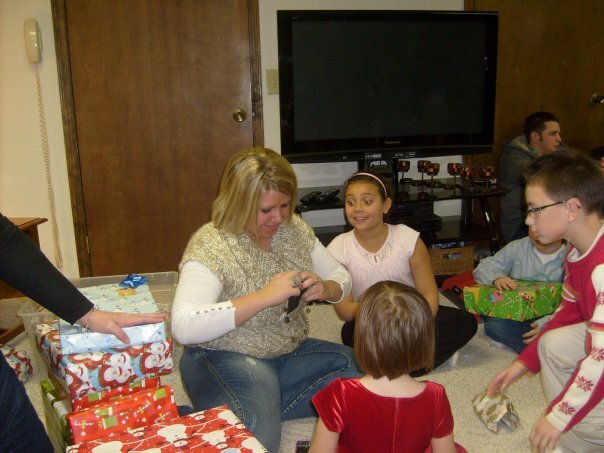 There are lots of other visits and activities that the kids do with their birth moms. From shopping trips for back to school supplies and clothes, to being a part of birthday celebrations, to weekend trips away with their birth families, dinners out for no reason other than to see each other, to the last minute just stopping over to see the kids. There are also emails, phone calls, and even text messages. There have been plenty of parties and celebrations over the years that both of our birth moms have been here for, and what it all boils down to is family. When we began this open adoption journey we honestly had no idea what it would look like, let alone feel like. I share with everyone who will listen that we have 2 children that are adopted and that we have open adoptions for both of them. I always get the same response, “I could never do that”. I just smile because there was a day and time I thought the same thing. It’s not so difficult really. Our hearts were opened to these small lives long before they were ever placed in our arms and their birth moms were placed in our hearts right along with those small little babies. Open adoption. Those two words aren’t quite so scary for me all these years later. 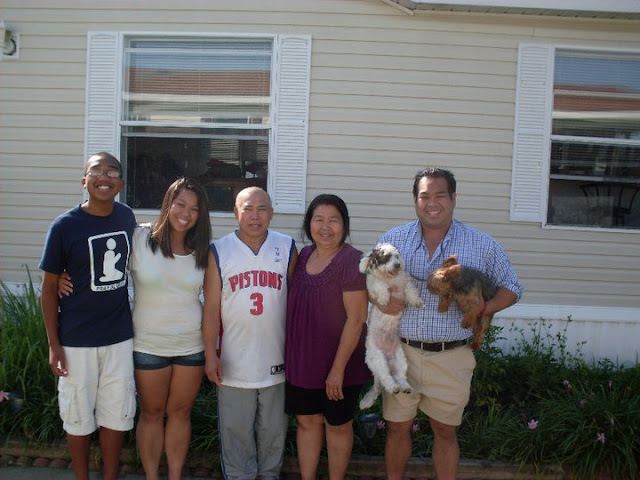 It is the “norm” for our family and our lives and I wouldn’t change it in the least. Jane and Alescia have given me more than just the dreams of my heart, they have taught me what selfless love looks like. They have laughed with us, cried with us, and enriched our lives in ways I never dreamed possible. So each night when I thank God for our children, I also thank Him for our birth moms. When I read through Arayna's post I was struck by the truth that so often the greatest rewards in life require the greatest risk. As Arayna's title "an unexpected blessing" suggests, when we confront our fears and insecurities we are often surprised by many of the good gifts our Lord has to offer us. When I see this family sitting in church I thank God for Arayna and Jeff's courage and their decision to open their lives up to two open adoptions. They are a living testimony. Thank you for sharing Arayna! Since this is Adoption Awareness month I have a little giveaway to encourage some awareness! And another reader will win our "It takes a village" navy shirt in either M v-neck (pictured) or L crew-neck. 1. Pick a post on this blog- any post- and share it on facebook to build adoption awareness. 2. Come back and comment on this post and tell me which post you shared. That's it! You will be entered to win one of the two prizes. Entries close next Wednesday at noon. Winner will be randomly electronically selected and announced next Wednesday evening. Happy adoption awarenessing! UPDATE 11/07: This giveaway is now closed. Thank you so much for everyone who shared on FB and left a comment! For the "It takes a village" tee: Katie B who said, What an amazing mom, thank you for sharing your story, Arayna. I hope that someday our relationship with my sons birth mom can be better. I shared this post on my Facebook in hopes that more people can understand how wonderful open adoption can be! Jillian- thinking of you as the days pass and you near your final trip to get your boy! Thank you Katie for sharing the post and for your thoughts as we anticipate bringing our little man home! Please contact me via private message on my facebook page with your shirt preference (M V-neck or L crewneck) and shipping address! 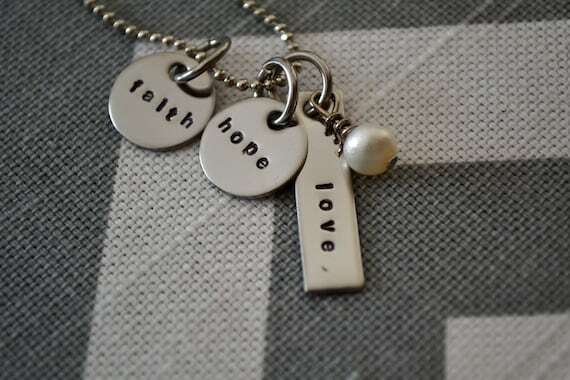 And for the choice of either "someday" or "faith hope love" necklace from my etsy shop, the winner is: Ashley with the comment, Aw I'm so excited for you Jillian. I shared "Meeting Him" from July. I can't wait for Thanksgiving so I can read about your trip home with your little boy. I've followed your story since GP days and I remember when you first were exploring the adoption in Russia. 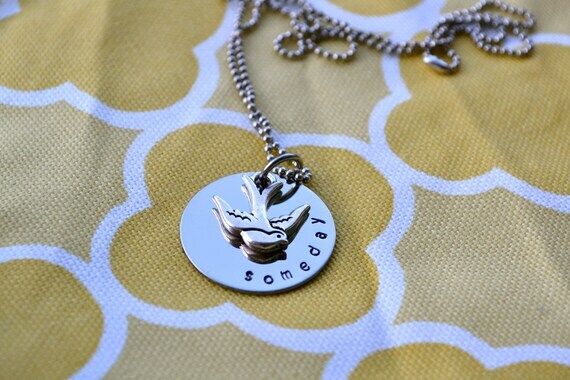 Ashley I am thrilled to stamp a necklace for someone who has been following our story since the very, very beginning! Please contact me with a private message on my facebook page and let me know which necklace you would like along with your shipping address! Thank you everyone once again for sharing my blog posts on your facebook pages and spreading the adoption awareness month love! There's a whole lot of courage, and love, and faith, and well, every emotion and feeling in these postings, Jillian and guests. Keep on keeping on. Looking so forward to meeting my nephew!! Wow! What a brave story. Hi Jill-I shared your maternity pictures, because they are so cute I can't get over it. Safe travels to Russia soon! Beautifully written and such a picture of selfless love by all involved. I shared the post "You Once Were Fatherless, but now..." It was one of my very favorites! Adoption here on earth is a beautiful portrait of what God did for us through salvation in Christ. I shared this post. The birth mother's loss is something that weighs heavily on my heart. Their pain so their child can have a better life is so self sacrificial it is amazing. Check out www.blessingsinabasket.org if you are a birth mom and need support or if you want to support a birth mom. <3 those girls! I shared this post on facebook! I have gotten comments on open adoptions a lot since we started this process, and it really took me by surprise. I always assumed that I would have an open adoption, my husband took a little convincing, but after speaking to the agency we are workin with, he is on board. It's so nice to see someones real-life experience with a open adoption that works so perfectly! LOVED THIS. Even though we aren't in the DIA program anymore, Arayna's words brought me to tears! Adoption is awesome. :) I shared this posted on Facebook. Thanks Jill! Just posts this to my wall. As an adoptive mom with 2 open adoptions I could not have said it better. Arayna hit the nail on the head! What an amazing mom, thank you for sharing your story, Arayna. I hope that someday our relationship with my sons birth mom can be better. I shared this post on my Facebook in hopes that more people can understand how wonderful open adoption can be! Jillian- thinking of you as the days pass and you near your final trip to get your boy! I shared this one because I think it would be so scary to have to do that. You have to have a lost of trust in God to know things will be okay. Well written and such truth! I shared this post on facebook and have enjoyed finding your blog recently. I can't wait to see how God completes your story! I loved this recent guest post. I posted "open adoption-an unexpected blessing" to my facebook page! Thank you! I follow a lot of adoption blogs and this is the first time I've read about an open adoption. Thank you for sharing! The love portrayed in this guest post is palpable. Very touching. I shared "Saying Yes to a Blessing" - my favorite post of yours! It still brings tears to my eyes. This post was fantastic to read! It answered some of my own fears and worries about open adoption, and helped me to look forward to that part of our journey in a new way. I shared this post on my FB wall, thanks so much for hosting this contest! Thanks for sharing your journey and Arayna's. I reposted because it's just so beautiful. I cry everytime I see Arayna's Mother's Day photo! Aw I'm so excited for you Jillian. I shared "Meeting Him" from July. I can't wait for Thanksgiving so I can read about your trip home with your little boy. I've followed your story since GP days and I remember when you first were exploring the adoption in Russia. I just shared your "Once you were fatherless. . ." post. I recently stumbled upon your blog. Thank you for sharing your story! I can't wait to hear about your final trip and the excitement of finally bringing your sweet baby boy home. Praying for a safe trip for you all and praising God for the gift he has brought you and your family! I shared your "Are you aware" post because I've found many people aren't aware of how beautiful adoption really is! I love reading your story and am praying for the day you get to bring your son home! I shared this post, because I've rarely heard of such open adoptions before. I think it would be a good post to spark discussion since open adoption can be kind of a controversial topic. I shared your "Meeting Him" post. My husband and I are currently in the process of adopting a child from Ethiopia - we can't wait til the day we get to meet them :) The long wait, we know, will be so, so very worth it! I shared the post on open adoption - we are ready and waiting right now, and I think that for our families, openess is what they worry about. We've now taken the time to learn and be educated and it doesn't frighten us like it once did, but I know some of our family members do wonder. Blessings to you in your journey to bring your little guy home! I shared this post! We are currently matched with an expectant mom who is going to have a baby boy any day now! She's full term tomorrow. :) We are thrilled that we've had the last couple months to really get to know each other and start forming a relationship. Our little guy is not even here yet, and his mom already feels like family to us! Have really enjoyed following your adoption story! You are both amazing, GODLY women! I am truly blessed by your stories of love and dedication for your children. God Bless You!